In the previous model [1-5], I discussed these signs and symptoms as unwanted sequelae of a highly active, energy-consuming immune system – highly unfavorable for the body and closely related to risk of premature death. When we think of the listed elements above, we immediately realize that the same signs and symptoms also appear in elderly individuals and in chronic inflammatory diseases in remission without much inflammation. In the latter two situations, energy expenditure of the selfish immune system is markedly smaller than in highly active inflammation (such as at disease onset or during disease flare-ups). If energy shortage is responsible for these signs and symptoms, why do they appear in the elderly or in disease-free remission of chronic inflammation?. Something is missing! Before we discuss the missing link of the above inquiry, it is recalled that an individual with a sedentary lifestyle who is 1.80 m tall and weighs 85 kg requires ~10,000 kJ/d . The total amount of energy required by the entire immune system in an inactivated state is ~1,600 kJ/d, and this level can increase by 25% during mild activation to 2,000 kJ/d . With this information, we need to explain the different degrees of inflammation and the related energy expenditure as demonstrated in Figure 1. Figure 1. Different levels of systemic inflammation prompt different levels of energy expenditure. The LEFT PANEL describes different levels of systemic inflammation as measured by serum IL-6 using the same high sensitivity ELISA. The data are demonstrated as a range from normal healthy young people up to patients with chronic inflammation and sepsis (references given below). It is evident that elderly people and patients with rheumatoid arthritis in remission have low levels of serum IL-6; In the RIGHT PANEL, the interrelation of systemic inflammation (specified by serum IL-6) and energy expenditure is given (the information is a schematical description based on ref. (1)). Increasing serum levels of IL-6 increase energy expenditure (energy expenditure is expressed in kJ/day [kcal/day]). The blue curve demonstrates the investigated interrelation (1). 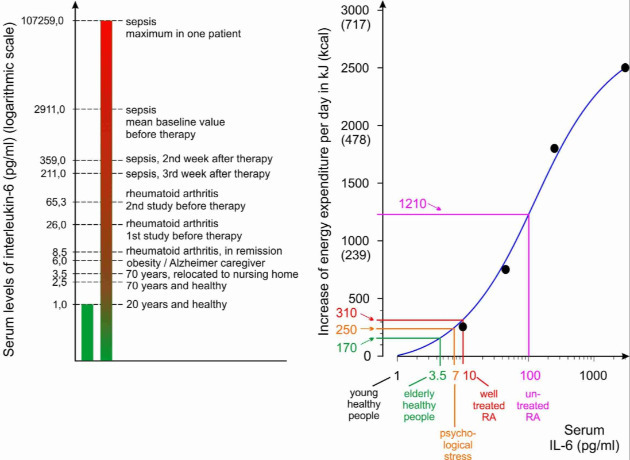 Five situations are demonstrated for 100 pg/ml of serum IL-6 in untreated rheumatoid arthritis (RA; pink line (2)), 10 pg/ml for well-treated RA (red line (3)), 6-7 pg/ml of serum IL-6 with psychological stress (orange line (4)), 3.5 pg/ml of serum IL-6 for healthy elderly (green line (5)), and 1 pg/ml IL-6 for young healthy individuals (5). The respective increase of resting energy expenditure is given on the y-axis with 1210, 310, 250, 170, and 0 kJ/day. Thus, only high levels of serum IL-6 prompt an enormous amount of energy expenditure. Note: Figure 1 references are listed at the end of this text, below the article’s references. When we consider energy expenditure in elderly individuals or patients with rheumatoid arthritis in remission, energy expenditure by the immune system should not be much elevated (Figure 1). In comparison to untreated active chronic inflammatory diseases or even sepsis, the increased levels of inflammation seen during aging, in situations of psychological stress and in patients with chronic inflammatory diseases that are in remission are not considered to constitute situations of high energy expenditure (Figure 1). What is the missing link? In all the discussions above (on elderly and chronically inflamed patients), we missed energy expenditure of a selfish and active brain although knowing. We know that the brain requires similar amounts of energy than the immune system (~2000 kJ/d, ). Indeed, increased psychomotor activity (brain and muscles) that is instigated by the brain induces extra costs as demonstrated in Table 1. Table 1. Activities causing an increase in daily energy expenditure. *Extra energy costs are relative to total energy costs in healthy individuals, and are given as a percentage of the basal or total energy expenditure. Note: Table references are listed at the end of this text, below the article’s references. To these extra costs of high psychomotor activity, we need to add the costs of low-grade inflammation that can be as a high as 10% over the normal basal metabolic rate as observed in compensated hepatitis C  or as demonstrated in Figure 1 (with low IL-6 serum levels). These extra costs for psychomotor activities are often present in patients with chronic inflammation in remission and in elderly individuals. These costs are not dependent on an active immune system. The new model is based on the idea that energy shortage in these groups of individuals depends on increasing energy expenditure caused by high levels of psychomotor activity (brain and muscles). For example, pain, psychological stress, sleeping alterations and anxiety increase energy expenditure. In previous articles [1-5], I indicated that these signs and symptoms (listed above) are merely the unfavorable sequelae of chronic inflammatory disease, but this is not correct. Instead, I propose a new model, in which these signs and symptoms represent positively selected and highly favorable coping mechanisms used by the body in situations of short-lived energy under-supply. These adaptive responses are not designed to be used for long periods of time; in fact, long-term use of these mechanisms will necessarily lead to the development of a maladaptive energy matrix, with concomitant loss of energy reserves (Figure 2). Figure 2. The adaptive and maladaptive energy matrix. In the middle of the figure a dotted line separates the two halves of the graph. The upper half demonstrates the evolutionarily positively normal response or adaptive response. It is called the adaptive energy matrix. Brain, immune system and storage organs (fat tissue, skeletal muscles) communicate with each other and induce adaptive responses depending on the prevailing short-standing threat (predator, wounding, starvation, thirst, cold, heat, or infection). The adaptive responses are necessary to protect energy stores. The lower half of the figure, below the dotted line, delineates disease consequences upon long-term application of these adaptive programs. Since the usually short-lived responses were not positively selected for chronic inflammatory diseases or aging, the responses fall outside adaptive norms. It is called the maladaptive energy matrix, which leads to disease consequences and premature death. Central to the problems is loss of physical and mental activity. If an energy shortage cannot be overcome, intentional physical and mental energy expenditure markedly decrease for a prolonged period of time (Figure 2). 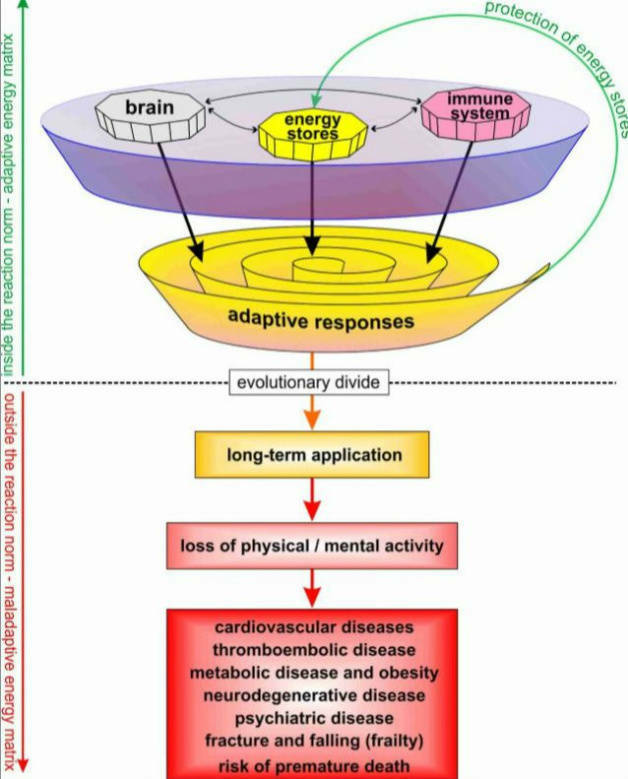 The long-term consequences of reduced physical and mental activity include cardiovascular diseases , metabolic diseases and obesity, cognitive dysfunction and pain [8,9], neurodegenerative disease [10,11], psychiatric diseases , frailty  and other chronic diseases such as cancer  (Figure 2). These conditions all constitute risk factors for early death. Thus, the current goal of achieving disease remission in chronic inflammatory diseases is not ambitious enough. Physicians and pharmaceutical companies should take the next step towards an integrative approach and conduct randomized controlled trials that look beyond immunosuppression. Psychomotor overactivity needs to be treated as well. Rainer H. Straub – Laboratory of Experimental Rheumatology and Neuroendocrine Immunology, University Hospital Regensburg, 93042 Regensburg, Germany. The contents of this article were adapted from: Straub RH. The brain and immune system prompt energy shortage in chronic inflammation and ageing. Nature Reviews Rheumatology, 2017, in press. Straub RH, Cutolo M, Buttgereit F, Pongratz G. Energy regulation and neuroendocrine-immune control in chronic inflammatory diseases. J Intern Med 2010,267,543-60. Straub RH. Evolutionary medicine and chronic inflammatory state – known and new concepts in pathophysiology. J Mol Med 2012,90,523-34. Straub RH. 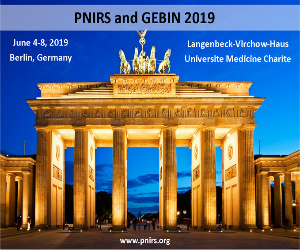 Insulin resistance, selfish brain, and selfish immune system: an evolutionarily positively selected program used in chronic inflammatory diseases. Arthritis Res Ther 2014,16(Suppl 2),S4 (pages 1-15). Straub RH, Cutolo M, Pacifici M. Evolutionary medicine and bone loss in chronic inflammatory diseases – a theory of inflammation-related osteopenia. Semin Arthritis Rheum 2015,45,220-8. Straub RH, Schradin C. Chronic inflammatory systemic diseases: An evolutionary trade-off between acutely beneficial but chronically harmful programs. Evol Med Public Health 2016,2016,37-51. Piche T, Schneider SM, Tran A, Benzaken S, Rampal P, Hebuterne X. Resting energy expenditure in chronic hepatitis C. J Hepatol 2000,33,623-7. Alves AJ, Viana JL, Cavalcante SL, Oliveira NL, Duarte JA, Mota J, Oliveira J, Ribeiro F. Physical activity in primary and secondary prevention of cardiovascular disease: Overview updated. World J Cardiol 2016,8,575-83. Chang YK, Chu CH, Chen FT, Hung TM, Etnier JL. Combined Effects of Physical Activity and Obesity on Cognitive Function: Independent, Overlapping, Moderator, and Mediator Models. Sports Med 2017,47,449-68. Paley CA, Johnson MI. Physical Activity to Reduce Systemic Inflammation Associated With Chronic Pain and Obesity: A Narrative Review. Clin J Pain 2016,32,365-70. Phillips C, Baktir MA, Srivatsan M, Salehi A. Neuroprotective effects of physical activity on the brain: a closer look at trophic factor signaling. Front Cell Neurosci 2014,8,170. Phillips C, Baktir MA, Das D, Lin B, Salehi A. The link between physical activity and cognitive dysfunction in Alzheimer disease. Phys Ther 2015,95,1046-60. Hallgren M, Herring MP, Owen N, Dunstan D, Ekblom O, Helgadottir B, Nakitanda OA, Forsell Y. Exercise, Physical Activity, and Sedentary Behavior in the Treatment of Depression: Broadening the Scientific Perspectives and Clinical Opportunities. Front Psychiatry 2016,7,36. McPhee JS, French DP, Jackson D, Nazroo J, Pendleton N, Degens H. Physical activity in older age: perspectives for healthy ageing and frailty. Biogerontology 2016,17,567-80. Kyu HH, Bachman VF, Alexander LT, Mumford JE, Afshin A, Estep K, Veerman JL, Delwiche K, Iannarone ML, Moyer ML, Cercy K, Vos T, Murray CJ, Forouzanfar MH. Physical activity and risk of breast cancer, colon cancer, diabetes, ischemic heart disease, and ischemic stroke events: systematic review and dose-response meta-analysis for the Global Burden of Disease Study 2013. BMJ 2016,354,i3857. Tsigos C, Papanicolaou DA, Defensor R, Mitsiadis CS, Kyrou I, Chrousos GP. Dose effects of recombinant human interleukin-6 on pituitary hormone secretion and energy expenditure. Neuroendocrinology. 1997;66(1):54-62. Cutolo M, Foppiani L, Prete C, Ballarino P, Sulli A, Villaggio B, et al. Hypothalamic-pituitary-adrenocortical axis function in premenopausal women with rheumatoid arthritis not treated with glucocorticoids. J Rheumatol. 1999;26(2):282-8. Straub RH, Pongratz G, Schölmerich J, Kees F, Schaible TF, Antoni C, et al. Long-term anti-tumor necrosis factor antibody therapy in rheumatoid arthritis patients sensitizes the pituitary gland and favors adrenal androgen secretion. Arthritis Rheum. 2003;48(6):1504-12. Lutgendorf SK, Garand L, Buckwalter KC, Reimer TT, Hong SY, Lubaroff DM. Life stress, mood disturbance, and elevated interleukin-6 in healthy older women. J Gerontol A Biol Sci Med Sci. 1999;54(9):M434-M9. Straub RH, Konecna L, Hrach S, Rothe G, Kreutz M, Schölmerich J, et al. Serum dehydroepiandrosterone (DHEA) and DHEA sulfate are negatively correlated with serum interleukin-6 (IL-6), and DHEA inhibits IL-6 secretion from mononuclear cells in man in vitro: possible link between endocrinosenescence and immunosenescence. J Clin Endocrinol Metab. 1998;83(6):2012-7. Holland-Fischer P, Greisen J, Grofte T, Jensen TS, Hansen PO, Vilstrup H. Increased energy expenditure and glucose oxidation during acute nontraumatic skin pain in humans. Eur J Anaesthesiol 2009,26,311-7. Xu Z, Li Y, Wang J, Li J. Effect of postoperative analgesia on energy metabolism and role of cyclooxygenase-2 inhibitors for postoperative pain management after abdominal surgery in adults. Clin J Pain 2013,29,570-6. Gaba AM, Zhang K, Marder K, Moskowitz CB, Werner P, Boozer CN. Energy balance in early-stage Huntington disease. Am J Clin Nutr 2005,81,1335-41. Hitze B, Hubold C, van DR, Schlichting K, Lehnert H, Entringer S, Peters A. How the selfish brain organizes its supply and demand. Front Neuroenergetics 2010,2,7-17. Yokozeki T, Watanabe J, Makita M, Hasumura S, Hamano M, Fujinami J. Work intensity during working hours and different types of care done by special nursing home workers. Nihon Eiseigaku Zasshi 1997,52,567-73. Markwald RR, Melanson EL, Smith MR, Higgins J, Perreault L, Eckel RH, Wright KP, Jr. Impact of insufficient sleep on total daily energy expenditure, food intake, and weight gain. Proc Natl Acad Sci U S A 2013,110,5695-700. Jung CM, Melanson EL, Frydendall EJ, Perreault L, Eckel RH, Wright KP. Energy expenditure during sleep, sleep deprivation and sleep following sleep deprivation in adult humans. J Physiol 2011,589,235-44. Fekete K, Boutou AK, Pitsiou G, Chavouzis N, Pataka A, Athanasiou I, Ilonidis G, Kontakiotis T, Argyropoulou P, Kioumis I. Resting energy expenditure in OSAS: the impact of a single CPAP application. Sleep Breath 2016,20,121-8. Schmidt WD, O’Connor PJ, Cochrane JB, Cantwell M. Resting metabolic rate is influenced by anxiety in college men. J Appl Physiol (1985 ) 1996,80,638-42. Gonseth S, Dugas L, Viswanathan B, Forrester T, Lambert V, Plange-Rhule J, Durazo-Arvizu R, Luke A, Schoeller DA, Bovet P. Association between smoking and total energy expenditure in a multi-country study. Nutr Metab (Lond) 2014,11,48-11.